Australian Guy Menzies’ flight from Sydney ended awkwardly when he crash-landed in a swamp at Harihari on the West Coast. His heroic effort helped to lift spirits on both sides of the Tasman against the backdrop of the Depression. The first successful trans-Tasman flight had been completed in 1928 by the illustrious Australian aviator Charles Kingsford Smith and his crew aboard the Fokker tri-motor Southern Cross (see 11 September). The 21-year-old Menzies took off from Sydney in Southern Cross Junior, a single-engined Avro Avian biplane. He carried neither a wireless nor food; ‘his luggage was one spare collar, a razor, and a toothbrush.’ He encountered rough weather over the Tasman and was driven well south of his intended destination, Blenheim. 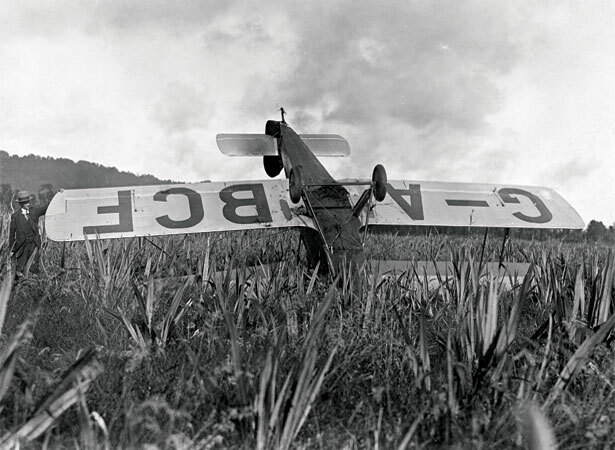 Shortly before 3 p.m., Menzies mistook a swamp near Harihari for flat ground and crash-landed his aircraft, which flipped upside down. He walked away with only a few scratches. While his arrival was less dignified than Kingsford Smith’s, Menzies took more than 2½ hours off his compatriot’s time, completing the flight in 11 hours 45 minutes. We have 9 biographies, 1 article, related to Bumpy landing for Tasman’s first solo flyer .